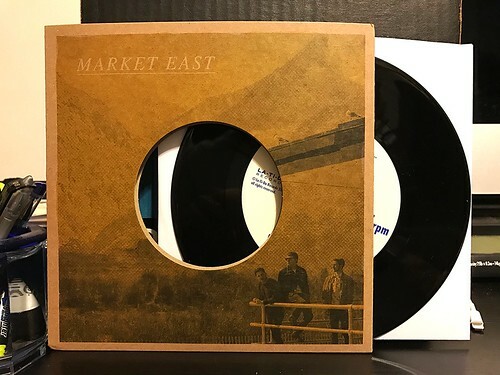 I Buy Way Too Many Records Dot Com: Market East - Orange & Me 7"
When the needle first hit the vinyl on this Market East 7", I was immediately interested in the sounds emanating from this record. It started off with a gentle, soulful bassline with some really nice vocal harmonies. I figured I was in for a Ballantynes-esque soul party, though that wasn't quite meant to be. While I enjoy A side "Orange & Me," it just kind of stalls out after the promising start. I kept waiting for the song to kick into a higher gear that it apparently didn't have. The end result is a perfectly serviceable 60's style throwback with truly some of the better harmonies I've heard in a long whole. It never reaches that next level that would really win me over. It's alright, but kind of a little boring. Unfortunately things don't really improve on the B side. It's not bad, but the sort of low key, vaguely psychedelic rock and roll that these guys are playing just isn't all that interesting to me. "Our Love Will Always Win" is slower than "Orange & Me" and not quite as catchy. It's a decent enough little 7", but it's not the kind that will keep me going back for repeated listens.